Karolina works at one of the Science Council’s Employer Champions and CPD Approved Employers, Affinity Water. Here she describes the benefits this brings to her as a science employee and as a Registered Scientist. I started working at Affinity Water in 2006 as a Sample Receptionist. Back than there were two of us in the team and when we moved to our current site we were tasked with setting up the sample reception area. There was little there initially, the sample reception didn’t exist like it does now with the shelves and bottles and everything. So we were proud of it; it was kind of like our baby. Chris Underwood, Principal Scientist, I guess he spotted my potential and he encouraged me to apply for a Scientist role in the inorganic chemistry department. That happened in 2007 and I’ve been working there ever since. In 2011 I got promoted and became Senior Scientist. Later in the year I was cross-trained in the organic chemistry department which was great, and again I built upon my existing lab skills. A year later I joined a professional body – the Royal Society of Chemistry – and in 2013, because I was always very interested in analytical quality control (AQC) I was given the opportunity develop this interest by carrying out a supporting role with the AQC team. 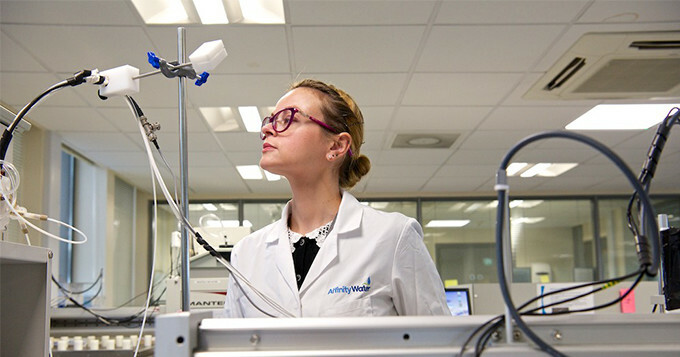 I’m offered all sorts of training at Affinity Water for example, starting from basic office skills like Excel, through to very specific lab skills like gas chromatography–mass spectrometry (GC-MS) and ICP-MS, which are very technical to do with the methods themselves. Recently I had training for my AQC support role. It was a course run by UKAS regarding internal auditing because I had begun to carry out internal audits on the analytical methods and I really enjoyed it. It’s an additional responsibility but I just love it. We’re also offered courses on leadership, influencing skills, and a range of other soft skills. To be approached by my manager to become a Registered Scientist was amazing. You kind of feel that he has trust in me, that he knows I deserve it and I’ve got enough skills and knowledge to become one, so it feels absolutely great; amazing! It was great to also have been keeping a CPD record at work. Because when you apply for professional registration you’ve already got a sort of template so it was a great, great help. If I didn’t have that I would have to basically sit down and do it from scratch, so it was a time saver, and you feel more confident as you know what skills would best match the competences. I was very much supported through the application process by my manager, Chris. At the moment he is also supporting me on working towards Chartered Chemist and Chartered Scientist status, he kindly agreed to act as my mentor. The most important thing about my employer investing in my professional development is the additional assurance it provides and it gives you more confidence in your own skills, and your own technical knowledge and responsibilities. I basically felt that it’s like an extra boost, so to speak. It’s more assurance and definitely gives you more confidence in your own skills and that what you do is done the right way. Contact us to find out more about professional registration or our Employer Champion and CPD Approved Employer programmes.